Cattlemen, Extension agents and other stakeholders soon can attend educational events at a new University of Florida facility dedicated to teaching how to manage the state’s grazing lands. About 6 million acres in Florida are used for grazing, said Range Cattle REC Director John Arthington. 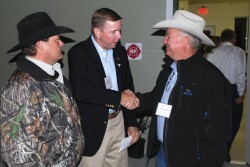 John Arthington, director of the University of Florida’s Range Cattle Research and Education Center, shakes hands with Cliff Coddington, of Bradenton, at last week’s opening of the Grazinglands Education Building at the research center in Ona. Coddington is also the Manatee County Cattlemen’s state director and the chairman of the Florida Beef Council. To Arthingon’s right is Steve John, a longtime Manatee County and Florida Cattlemen’s Association member from Myakka City. The Grazinglands Education Building was made possible by more than $380,000 in private donations, state and federal money, Arthington said. The initial gift, a $150,000 grant awarded by the Mosaic Company Foundation, started the building’s construction. Most of the remaining funds came from the Florida Cattlemen’s Foundation, said Arthington, an Institute of Food and Agricultural Sciences faculty member. The ceremony capped facility improvements that began in July that include bathroom and office renovations so they comply with the Americans with Disabilities Act. Arthington added that the new 2,100-square-foot building, which includes the Mosaic Grazinglands Classroom, will let his faculty and staff conduct education events year-round. Until now, the facility was limited to conference rooms that seat 15 to 20 people, and any teaching and learning activity with more than 20 had to be held outdoors. The new building can accommodate 90. Faculty and staff at the Range Cattle REC started a fundraising drive in 2006 to update the facility, which opened in 1941, Arthington said. Beginning with graduate student housing ? paid for by the Florida Cattlemen’s Foundation ? and continuing with the building and with remodeling labs, offices and faculty support space, the center’s revitalization was nearly completed. The next step was to construct the Grazinglands Education Building, Arthington said. A capital campaign, called the Final Drive, raised $225,000 in private donations toward the $380,000 needed for the education building and remaining remodeling projects. The Range Cattle REC is also raising money through its “Campaign for Ona,” Arthington said. With this effort, the center hopes to generate funding to increase present endowments and create new ones. The two major endowments are the Excellence Endowment, established by Herb and Muncy Chapman in 2007, and the Florida Cattlemen’s Endowment, established by Don Plagge this year. Support from these two endowments helps research and Extension programs. Chapman is a retired beef cattle professor at the Range Cattle REC. Plagge serves on the Florida Cattlemen’s Foundation Board of Directors. Gifts for the “Campaign for Ona” may be given to either fund, or they may be designated by the donor to establish an individually named fund. The minimum gift for a named endowment is $30,000. You can donate by contacting Arthington at jarth@ufl.edu. Range Cattle REC faculty focus their research on livestock, forages and natural resources associated with Florida’s grazing lands. The facility is in the heart of the state’s cattle industry, situated near 80 percent of the state’s 1 million beef cows. The center has 700 head of cattle on 2,840 acres.